The Las Vegas Strip is home to many things that you’d be hard-pressed find anywhere else—and, generally, that’s a good thing. The Las Vegas Strip is home to many things that you’d be hard-pressed find anywhere else—and, generally, that’s a good thing. But at the corner of Las Vegas Boulevard and East Harmon Avenue is one example—albeit writ large—of something that is increasingly being found just about everywhere. 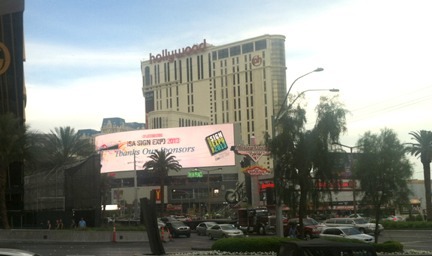 Sure, it’s the biggest electronic sign in Las Vegas, but even small-scale “dynamic digital signage” (DDS) is muscling into territory that used to be strictly the purview of static, printed signs. If you have been to major metropolitan centers, electronic signage is nothing especially new. Old films and photos of New York City’s Times Square demonstrate that dynamic signage has been around at least for decades, even if it wasn’t necessarily “digital,” and it was in the early 2000s that I recall LCD monitors started appearing over selected subway station entrances. But over the past several years, digital displays become more and more prevalent both indoors and out. On the show floor, a special “Dynamic Digital Signage Park” may have been a bit of sensory overload, but it did showcase the latest state of the technology, as well as offer regular presentations that discussed both the technology and the business of digital signs. On Friday, Alan Brawn, principal of Brawn Consulting, gave a presentation titled “Add Dynamic Digital Signage to Your Business with the Digital Signage Federation.” “This event will be remembered—two, three, four years from now—as the year the signage industry recognized dynamic digital signage as part of the business model,” said Mr. Brawn. Identifying DDS as being past the “early adopter” and moving into the “early majority” phase, he then presented some bullish forecasts on the DDS market. Last year, DDS was a $7 billion market (including the cost of hardware), and it is forecast to hit $15.5 billion by 2016. Indeed, in all of the forecasts of the digital signage market, even the most bearish have it growing at no less than 20% annually. What gets counted as digital signage includes what we would normally think of as “TV screens”—the displays that are popping up regularly in doctors’ waiting rooms, hotel in-room entertainment systems like LodgeNet (they display messages in addition to TV and movie programming, so technically they are considered signs), and displays mounted on gas pumps (familiar for a few years if you traverse the Massachusetts Turnpike and avail yourself of the service centers). These things are not new, of course, but as displays become cheaper and easier to install and maintain in a wide range of environmental conditions, they are replacing certain types of static, once-printed signage. Mr. Brawn was quick to add that “static signs are not going away,” so the printing industry doesn’t have to worry too much about losing another application to electronic media—yet. Marketers have seized on DDS, Mr. Brawn said, thanks to studies—such as those from Arbitron—that have shown that “one in three consumers made an unplanned purchase based on seeing something on a digital sign.” (A lot of this could very well be the novelty of dynamic signage; I’d be curious to keep tracking this after we have become used to—and perhaps blasé about—it.) At present, digital signage is considered “behavior-changing” technology. Drivers of growth in dynamic digital signage include the declining cost of the hardware, its aforementioned effectiveness as an advertising and promotional platform, as well the growing ease of generating content and piping it to the displays. But the killer app of DDS is its flexibility. “Dayparts” is the marketing and advertising term for the ability to sell outdoor graphics by time of day—a billboard that says one thing at rush hour and something else during off-peak times, as an example. Although outdoor graphics is only one piece of the overall signage market—and DDS market—digital outdoor displays are not without their controversy, and many municipalities have been looking to regulate outdoor DDS, or at least attempt to determine whether they are a traffic hindrance (a distraction that can cause traffic jams or accidents) or a help (a useful resource that dynamically conveys warnings and advisories). Perhaps not unexpectedly, Los Angeles in particular has pitted outdoor advertisers against the government, and against each other. Great article, Richard. Thank you. I'm glad people are starting to realize what a fantastic medium digital signage is. Super flexible, efficient and beautiful to boot. I would agree that traditional media still has its place in the industry, and with the right marketing strategy and creative, can be extremely effective. Digital signage is just a more robust version of traditional (looking at it from a simplistic standpoint). Think your company would like to use digital signage? Then check us out www.adcentricity.com or tweet us @ADCentricity. We'd be happy to help you get an understanding of the complexities of digital signage.